Citizens in Australia’s major cities are becoming increasingly unhappy about what they perceive as the escalating deterioration in their quality of life - traffic congestion, overloaded public transport, unaffordable housing for young people, increases in the costs of basic services and overcrowding. There is little doubt that recent election results and unfavourable opinion polls are partly an expression of this dissatisfaction. ‘Save Our Suburbs’ believe that these adverse trends are the result of high-density policies that have been imposed onto communities by state governments. Due to the misleading misinformation that has accompanied these policies, the public may not fully realise the connection between these policies on the one hand and deteriorating standard of living on the other. It is only when one sweeps the propaganda veil aside that one realises how shallow, trivial and sometimes downright deceptive the spin has been. The premise behind this government totalitarianism is that high-density living is better for the environment. They say that people will use their cars less and that greenhouse gas emissions will be greatly reduced. While these two propositions sound very much like commonsense the unfortunate fact is that the data does not bear them out. An idealised Melbourne study currently being quoted assumes that people, no matter where they live, will drive to the central business district daily. This is a completely unrealistic assumption. 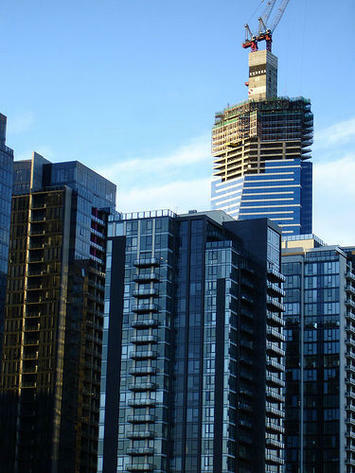 Only 9.9 per cent of employment in Melbourne is in the CBD. The majority of destinations for most people in the suburbs lie close to where they live and they do not in fact make daily trips to the CBD. To get a better understanding we should look at the Australian Conservation Association’s Consumption Atlas, which shows greenhouse pollution per person in each postal code. The underlying research shows that the actual travel energy used by dwellers in inner Sydney suburbs is more than those in the outer suburbs, even when air travel is excluded. When domestic energy is added to travel energy, the energy total for people in the inner suburbs is 22 per cent more than those living in the outer suburbs. This is because of energy needed in high-rise buildings for communal lifts, scores of individual clothes driers and ever-present security lighting in foyers and garage spaces. While we do concede that private transport generates somewhat higher greenhouse gas emissions than public transport, the difference is not nearly as much as people think. Greenhouse gas emissions per passenger kilometer on Sydney City Rail are 105 gm. The figure for the average car is 155 gm. It is much less for modern hybrid vehicles, being a mere 70 gm. Furthermore, a study of Melbourne areas shows that the people squeezed into newly converted dense areas did not use public transport to any greater extent and there was little or no change in their percentage of car use compared to living in the previous low-density. In fact, traffic congestion increases whenever high-density policies are imposed wherever you are in the world. Any slight increase that may occur in the proportion of people using public transport is overwhelmed by the greater number of people squeezed into that area. The resulting congestion causes higher fuel consumption and dangerous exhaust emissions. The authorities fail to admit that many people still require their cars for getting to the many workplaces, sporting facilities, and relatives and friends homes not easily reached by public transport and for transporting items that are impractical or illegal aboard public transport such as weekend recreation equipment and the family pet. High density advocates claim that high-density saves money. This is palpable nonsense. We are all acutely aware that high-density policies have resulted in a dramatic rise in the price of housing, due to the government enforced infill policy causing land scarcity, thereby locking out an entire generation of young people from the housing market. We are also conscious of substantial rises in the cost of services such as electricity, water and sewerage due to the incredibly inefficient modifications required to increase capacity in areas originally designed for lower densities. A tragic and often overlooked failure of high-density policies is the adverse effect on human health, especially mental health. There is a considerable body of peer-reviewed research proving the link between density and ill health. An article published on 23 June 2011 by eleven authors in the prestigious scientific journal, Nature, states that the incidence of schizophrenia in city dwellers is double that of people living in less crowded conditions. This article has received worldwide media attention. In view of the serious mental health situation existing in our society, those forcing high-density onto communities that do not want it, should hang their heads in shame. We reiterate that we have no issue with those of us that prefer living in a high-density area or with the free market construction of buildings to fulfill that limited demand. What we object to, is having draconian high density policies based on demonstrably faulty premises forced upon the 83 per cent of people that Australian research shows prefer to live in a free-standing home. This is especially so when the result is maddening traffic congestion, more greenhouse gases, a creaking and overloaded infrastructure, the young and disadvantaged unable to afford their own home and poorer health outcomes. This piece first appeared in On Line Opinion. Submitted by sestamibi on Wed, 08/31/2011 - 22:49.